Long Acres Ranch is a privately held property and use is limited to managed activities and planned programs and events. Management reserves the right to remove or prohibit visitors from entering the property based on failure to adhere to guidelines, signage, warnings, and/or instructions. For the safety and enjoyment of all visitors, and to protect the ecological health of this important natural land, all visitors are expected to abide by the following rules. We appreciate your respect for the land and other guests. Please report safety hazards or suspicious activities to the Ranch staff. In case of emergency, visitors should call 911, and then call the Ranch at 281-239-7998. All visitors must register prior to entering the Ranch. Additional guidelines may apply depending on program, activity, and event. 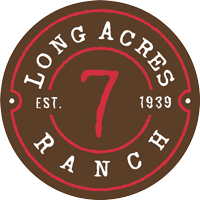 Long Acres Ranch normal business hours are Monday – Friday 9:00 AM – 5:00 PM. The property currently operates with closed and monitored access. Weather may alter programming which is subject to change without notice. On bad weather days, our staff is available after 8:00 a.m. to discuss rain accommodations or possible rescheduling. All visitors are required to sign a liability release form provided at the time of registration with the Ranch. A parent or legal guardian must sign for children under the age of 18 years old before participation in any program, activity, or event held on the property. All children under the age of 18 years old must be accompanied by an adult. Supervision of children is not provided by the Ranch staff. Individual liability release forms may be covered by a Certificate of Liability Insurance provided by the program organization for a specific event. Use fees are determined by program, activity, or event. For the benefit of other visitors and wildlife, please maintain respectful noise levels at all times. Amplified noise, music, or sound is not allowed. An exception may be granted for specific events. Disorderly conduct, including excessive noise, is strictly prohibited. Failure to comply can result in removal from the property. We recommend that, for their safety, guests wear closed toe shoes. Sandals are not recommended. Mosquito and bug repellent is recommended. Due to their sensitive ecology, pets, with the exception of service and working animals, are prohibited from the property. Pets can disturb wildlife, impede enjoyment of the Ranch by other visitors, spread diseases to wildlife, or leave stools that can create serious sanitation problems or contain seeds from non-native plants. Visitors with service and working animals must collect and dispose of stools in proper receptacles. Littering is strictly prohibited—help keep the Ranch clean! Please dispose of litter in proper receptacles. Except for water or sports bottles, food and drink are not permitted on trails. Glass containers are not allowed. Alcohol is not permitted on the property. Firearms and concealed weapons are not allowed on the property, except by certified peace officers and active duty personnel. Pictures may be taken anywhere on the Ranch. Please turn off/silence cell phones and refrain from private conversation during programs and activities. Please protect the Ranch and its inhabitants. Do not cut, break, injure or remove any shrubs, trees or flowers. Driving nails, screws or other objects into trees or otherwise disrupting the natural environment is prohibited. Houses on the property are private homes. Do not climb trees or fences. Collection of plants and animals is prohibited. This includes harvesting firewood; collecting mushrooms, wildflowers or other wild plants and their seeds; and otherwise removing or damaging any plants or trees. Collection of any kind is prohibited, as is the use of metal detectors. The fine for removal of any plant, wildlife, or artifact from the property without prior written permission may be assessed up to $500. Hunting and fishing are prohibited. Visitors may not kill, injure or otherwise disturb any animals or their nests. For the protection of animals and visitors alike, please do not feed the wildlife. Please stay on maintained trails to avoid detrimental impacts to the local ecology, as well as individual safety. Off-trail activity is prohibited. Some trails are closed or re-routed to minimize detrimental impacts and to protect sensitive habitats; i.e. some areas may be closed during bird nesting season. Nature hiking trails are intended for walking. Trail users are asked to be polite and courteous to other visitors. Trail users should walk on the right side of the trail. Trail users should give an audible warning before passing others and follow all signs. A tractor driven people-trailer is available most days for the purpose of transporting visitors from one site to another on the Ranch. All rules and instructions given by the driver and staff must be followed. Motorized vehicles are restricted and are prohibited from trail areas. Some areas are restricted to authorized vehicles only. Vehicles must be parked in designated areas. Limited PRIMITIVE Camping is currently available at the Ranch by members of the Boy and Girl Scouts of America. Camping represents a potential threat to natural areas because of the accompanying threat of fire and increased impact on vegetation. For this reason, camping is limited to non-profit organizations and educational groups. We encourage all campers to use Leave No Trace ethics. Tent camping is allowed in designated areas only. For the safety and security of overnight camping guests, staff is required to be on-site at all times. Campfires are only allowed in designated areas. Firewood is not provided and may not be collected on site. Campers must extinguish all fires before leaving. Hot coals can be disposed of in camp fire pits. Please remove waste and refuse when you leave. Individuals from educational, research, academic, governmental, clubs, or other recognized institution may conduct non-destructive field study, research, or projects on the Ranch with prior written permission. Please contact the Director for more information. We believe the Brazos River is not suitable for swimming and presents significant dangers to life under many conditions. For this reason, we strictly prohibit public access to the river from the Ranch for swimming or water sports.